Wikimedia/Poreddy SagarA chameleon perfectly blended into its environment waiting for the perfect opportunity to snag its prey. A study published this week in Nature describes in surprising detail how chameleons catch their food. é libre de Bruxelles examined just how agile and feisty these cool creatures actually are. They have got opposable toes for staying snug on branches, eyes that can move 360 degrees freely from one another, and colour-changing skin. 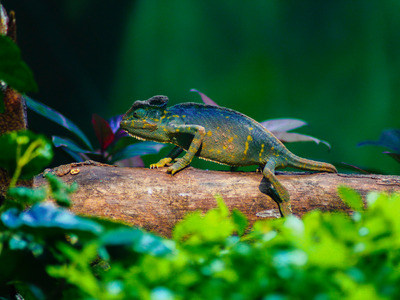 But perhaps one of the chameleon’s most impressive qualities is its use of an adhesive tongue to catch prey by projecting it out into the environment at high speeds. Their tongues can extend twice their body length and move up to 1,500 m/s2. To put that into perspective, Usain Bolt runs his 100-meter dash at about 12.5 m/s2. When the tongue touches the animal’s prey, it comes whipping back into its mouth almost as quickly as it shot out. But how do these chameleons make sure that their prey comes back to their mouth with the tongue? They use a sticky mucus, of course. The scientists involved in the study measured just how sticky this mucus is by rolling beads on top of it and measuring the drag factor. They found it to be an incredible 400 times stickier than human saliva. Although these seemingly cool creatures appear to be pretty laid back in their demeanour, it turns out they actually pack quite the punch and know how to take care of business.